SEATTLE – Seattle Fire Department boat pilots will practice how to respond to vessel and maritime facility emergencies using the Seattle Maritime Academy’s vessel bridge simulator. The simulator mimics a fully functional bridge facility, including controls, communications, radar and realistic 360-degree visual displays. The training has been specifically tailored to the types of vessels and navigation routes that Seattle Fire Department fire boats are likely to encounter. The SFD staff will practice navigation and communication skills using scenarios such as a vessel fire in the Duwamish Waterway, or crossing the Puget Sound to assist with a fire in Eagle Harbor in Bainbridge Island. The first set of simulator runs will happen on Feb. 6, 2019, between 2 and 3 p.m. The simulator training is part of a general training for boat pilots and staff at SFD, so they can to respond quickly and safely to fires and other emergencies involving vessels and maritime facilities. It is an example of the kind of partnerships and services Seattle Colleges provide to local agencies and the community. This training builds on skills such as rules of road best practices, radio communications best practices and licensing, working within Vessel Traffic Systems, bridge resource management, and radar and electronic chart display and information systems. The Seattle Maritime Academy is a division of Seattle Central College that prepares men and women for successful careers in passenger transportation, fishing and seafood processing, international trade, military operations and other maritime sub-sectors. The academy also provides customized trainings for government agencies and businesses in the maritime industry, including the Washington State Ferries and tug boat operator Foss Maritime. SEATTLE – Firefighters responded to the 600 Block of 23rd Ave. E. just after 1 a.m. on Feb. 6, 2019 for a report of a house fire. When Engine 25 and Ladder 10 from the Capitol Hill Fire Station first arrived on scene, they saw a two story house well-involved in fire, and a house to the south with flames showing from the roof and attic area. The response was immediately upgraded to a 2-alarm, bringing in additional units to help with firefighting efforts. Crews worked quickly to put water on the fire and protect other nearby structures. They had the fire under control in both structures within 30 minutes, and fully extinguished within 70 minutes. Firefighters worked in subfreezing temperatures and travelled to the incident with chains on their apparatus. Water runoff was taken into consideration, as water on roads would likely freeze overnight. The Seattle Department of Transportation was requested to the scene to treat the roads for ice. Two people in the house to the south of the primary fire structure were able to escape the fire prior to SFD arrival, due to alert neighbors who began knocking on doors. Firefighters conducted a search of both structures and determined the primary fire house was unoccupied at the time of the fire. At the height of the fire, there were eight engines and five ladder trucks on scene. Fire investigators are in the process of conducting an investigation to determine the cause, estimated loss and point of origin. Further updates on the cause will follow. UPDATE 2/6 at 8 p.m.: Fire investigators have ruled the cause of the fire as accidental, and determined it started from an energized baseboard heater. The fire started in the living room on floor 1 of the house to the north, and spread to the adjacent house on the south side. Total estimated loss is $200,000 to the north house and $250,000 to the south house. Never allow any item to drape across or be placed on top of a heater. Move away any furniture, bedding and other materials placed too close to baseboard and portable heaters. Did you know that it takes only two seconds of exposure to 148°F (64°C) water to cause a burn serious enough to require surgery! Coffee is often served at 175°F (79°C), making it high-risk for causing immediate severe scald burns. For National Burn Awareness Week (February 3-9, 2019), the theme is scalds and how to prevent them. Most common rooms for burn injuries are the kitchen and bathroom. Babies and small children are especially vulnerable to scalds from hot water or steam. Never leave a child alone in the bathroom or kitchen. If you must leave the room, take the child with you. Set your water heater to 120 degrees Fahrenheit or below. Consider installing water faucets and showerheads containing anti-scald technology. Keep hot foods and liquids away from table and counter edges. Never carry or hold children and hot foods and/or liquids at the same time. Use back burners, and turn pot handles to the back of the stove when cooking. Keep appliance cords out of children’s reach, especially if the appliances contain hot foods or liquids. More information from the American Burn Association. Snow has finally arrived in Seattle, and freezing overnight temperatures are forecast to stick around much of the week. 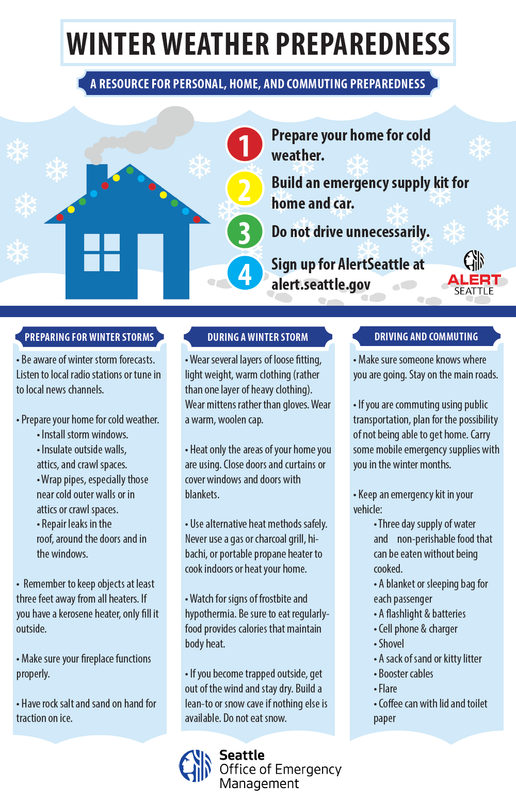 Please review these tips to keep safe and enjoy this winter wonderland while it lasts. Avoid unnecessary driving! Take the bus, light rail or train if you can. If you must drive, take your time, leave lots of distance between you and other vehicles, use your turn signals and headlights. Stay on main roads that have been cleared, and let someone know where you are headed. Grab emergency provisions, such as water, snacks and blankets before heading out. Ladder 10 is just one of many Seattle Fire Department apparatus driving with chains during this weather so they can safely navigate the snowy and icy streets. Take care when walking in the snow. Even when sidewalks and driveways look clear, there could be patches of ice. Wear shoes with good tread, wear high-visibility or reflective items and keep your hands out of your pockets in case you slip and need to break a fall. Avoid walking in the streets – vehicles may also slip and slide. CO is an odorless, colorless gas produced by common household appliances powered by gas or oil, such as furnaces, water heaters, ovens and ranges. Keeping appliances properly vented and in good working condition is the best way to prevent build up of CO. Installing working CO alarms and testing them regularly is also important. If using a generator or portable cooking source, make sure it is outside and away from doors and windows. Call 9-1-1 right away if experiencing these signs of CO poisoning: headache, dizziness, fatigue, confusion, tightness in the chest and breathing difficulties. Tune into local radio and TV stations or track their social media channels for the latest weather and traffic information. Follow key City departments on social media to learn how Seattle is responding. Seattle’s Office of Emergency Management offers great tips on their website. SDOT also offers all commuters some guidance on what to do during inclement weather. During times of celebration, there are common fire safety issues that all communities experience. Keep these safety considerations in mind this Chinese New Year and Vietnamese New Year (February 5). Celebrations mean cooking and sharing food. Cooking related fires remain the main cause of fires during holidays and celebrations. Most fires start from cooking left unattended – use a timer, never leave when cooking, especially when cooking with oil. If a pot is on fire, cover it with a lid or flat metal pan. Use battery powered candles instead of wax candles to be extra safe. Keep incense and candles away from drapes, pillows, bedding and anything that can burn! Burn incense or candles in a sturdy, heat resistant container. Put incense and candles out before leaving the room or before going to bed. Smoke alarms should never be disabled. Use a dish towel to stop the alarm from beeping if cooking smoke sets it off. Test the smoke alarm by pushing the test button every 2 months. Replace battery yearly. When the smoke alarm goes off, that is the signal to follow the escape plan. Get out and call 9-1-1 from a safe location. The Seattle area has seen a few windstorms already this winter that have knocked out power to thousands of homes. One danger we have during power outages is the increased possibility of carbon monoxide (CO) poisoning. Carbon monoxide is produced any time fossil fuels are burned. During a power outage, the use of gas generators, outdoor grills, in carports or too close to the home can trap CO in the home and cause CO poisoning. Other possible sources of CO include small gasoline engines, stoves, lanterns, burning charcoal and wood, and gas ranges and heating systems. Carbon monoxide is a gas that can cause severe illness or death. What makes it so difficult to detect is that it is odorless and colorless. According to the Centers for Disease Control and Prevention, at least 430 people die from accidental carbon monoxide poisoning in the United States every year. And each year, around 50,000 people go to the emergency department from CO poisoning. Do not use items that produce carbon monoxide inside your home or garage or outside an open window. Never use gas ovens to heat your home, even for a short time. If you use a fireplace or wood stove, make sure that chimneys and flues are in good condition and are not blocked. Never idle a car in a garage, even when the garage door is open. Make sure carbon monoxide alarms are installed on every level of your home and outside every sleeping area. Test your CO alarms along with your smoke alarms monthly and change the batteries at least once a year. If the CO alarm sounds, turn off any heating appliance and open windows to get fresh air. Call 911 if you experience CO poisoning symptoms such as dizziness, vomiting, or headaches and move to fresh air immediately. If you suspect an appliance is the source, call a qualified technician to fix the problem before restarting the appliance. The department activated and staffed its Resource Management Center (RMC) on Jan. 12 to have the ability to closely monitor response times, and make recommendations based on analysis. Depending on circumstances, recommendations could include up-staffing units, placing additional units on the streets, or implementing bicycle medics. The RMC is located at Fire Station 10, and will stay activated through the duration of the 3-week closure. Specific emergency response routes have been identified and will be used by firefighters when they are responding to the scene. The department has worked with the Seattle Department of Transportation to eliminate some parking spaces on these response routes, which will allow emergency vehicles to respond more quickly on these roads. All community events are temporarily suspended. Multiple emergency helispots have been identified to transport critical patients to Harborview. This would only occur under very rare circumstances. The helispots are located at large parks, such as Seward Park and Magnuson Park. Continue to call 911 only for emergencies. SEATTLE – Firefighters responded to the 4400 Block of Lake Washington Blvd. S. just after 9:20 p.m. on Jan. 13 for a report of multiple boats on fire at Lakewood Moorage. When Engine 28 from the Rainier Valley Fire Station arrived on scene, they saw flames coming from the marina, with three vessels fully engulfed in flames. Firefighters stretched nearly 2,000 feet of hose to reach the boats, and initially fought the fire primarily from land units. Once the Fireboat arrived on scene, water was applied on the fire from multiple angles. Due to quick and efficient firefighting efforts, the fire was knocked down in just over 20 minutes. Divers from Rescue One suited up, in case any rescues were needed. Firefighters untied and moved nearby boats, to prevent them from catching fire. A boat owner and his dog were able to escape the fire, with assistance from Seattle Police Harbor Patrol and Seattle Fire. The approximately 59-year-old male patient was evaluated by Seattle Fire Department medics, and transported via AMR to the hospital with minor injuries. A Seattle Police Officer helped keep the displaced dog warm, while they waited for the owner to return. Fire investigators responded to the scene and are actively investigating the cause. Further information will be released as it becomes available. Three vessels were a total loss. UPDATE: Fire investigators have ruled the cause of the fire as undetermined. Total estimated loss is $200,000. SEATTLE – The Fire Alarm Center received a 911 call at 1:20 a.m. on January 9 reporting a fire in a residential home at the 2500 Block of Northeast 92nd Street. Engine 40 responded from the Wedgewood Fire Station and saw flames coming from the front and sides of the single-story structure. All occupants had safely evacuated prior to SFD’s arrival on scene. Firefighters fought the fire from outside of the structure, and then transitioned inside to push fire out. The fire was under control by 1:41 a.m. The American Red Cross was called for five displaced adults. There were no injuries to members of the public or firefighters. Fire investigators ruled this fire as accidental, and set the total estimated loss at $350,000. The fire was caused by an overheated cell phone battery charging unit that was plugged into a full strip multi-outlet extension cord, which was plugged into a second full strip extension cord, which was plugged into the wall outlet. Avoid using extension cords and plug adapters. Extension cords are designed to provide a temporary power source. Make sure extension cords are not tacked to walls, run under rugs, or through doorways. Utilize power strips with internal circuit breakers instead of extension cords to prevent overheated electrical extension cords. Consider having a licensed electrician add an outlet if needed. Never use an extension cord with a portable heater. If an appliance produces heat (like toasters, rice cookers, coffee makers, kettles, portable heaters, irons, etc.) unplug it when not in use.